It was alarming to learn that during 2017, the Transportation Security Administration found a record setting 3,957 firearms in carry-on bags at airport checkpoints. That was 16.7 percent (556 more) firearms than found in 2016, when ‘only’ 3,391 firearms were found. Will 2018 see a dip in the number of firearms passengers bring to the security checkpoints? Not likely: It’s only February and another record has been broken: between February 5th and 11th, TSA found a record breaking 104 firearms in carry-on bags. Of those 104 firearms, 87 were loaded and 38 had a round chambered. The previous week-long record? 96 firearms found during one week in July 2017. For the Runway Girl Network, I put together a year-end review of the guns, weapons and assorted odd items discovered by TSA at airport checkpoints during 2015. In 2014, the TSA reported that it had discovered 2,122 firearms in the carry-on bags of passengers. That was an average of six firearms per day and was a 22 percent increase over the number of firearms (1,813) found in 2013. TSA’s official 2015 Year in Review is due out any minute, but my unofficial tally taken from the weekly reports on the TSA Blog adds up to 2,495 firearms found at airport checkpoints this past year – which is yet another new record. Of course, prohibited items found by Transportation Security Officers in carry-on bags and on passengers passing through security checkpoints aren’t limited to firearms. Last year TSA found, 40 pounds of marijuana in one man’s bag at Phoenix Sky Harbor International Airport, a meat slicer at Southwest Florida International Airport and a knife concealed inside a souvenir replica of the Eiffel Tower, found at Oakland International Airport. And, in the same week in March that the TSA found 55 firearms (51 loaded; 13 with a round chambered) and 13 stun guns, a Chihuahua was discovered inside a checked bag at New York’s LaGuardia Airport. “Apparently, the dog climbed in while its owner was packing her suitcase. TSA worked with the airline to identify the owner, and the two were happily reunited,” the TSA reported. Signs like this are now posted at airports in Houston. There’s a new “open carry” gun law in Texas that allows legally licensed handgun owners to openly carry a holstered gun in public. Federal law still prohibits passengers from bringing weapons to or past airport security checkpoints and the TSA is permitted to issue fines to travelers found with loaded or unloaded guns. But an amendment to the Texas handgun licensing law that went into effect in September says a passenger found with a licensed gun at an airport checkpoint won’t be subject to felony charges as long as the gun was taken to the airport by accident (the explanation the TSA says most everyone caught with a gun at an airport seems to give) and as long as the passenger immediately takes their gun away from the secure area when it’s found. The TSA issues a weekly report of the number of firearms (and other prohibited items) found at airports checkpoints and does an annual year-end tally. 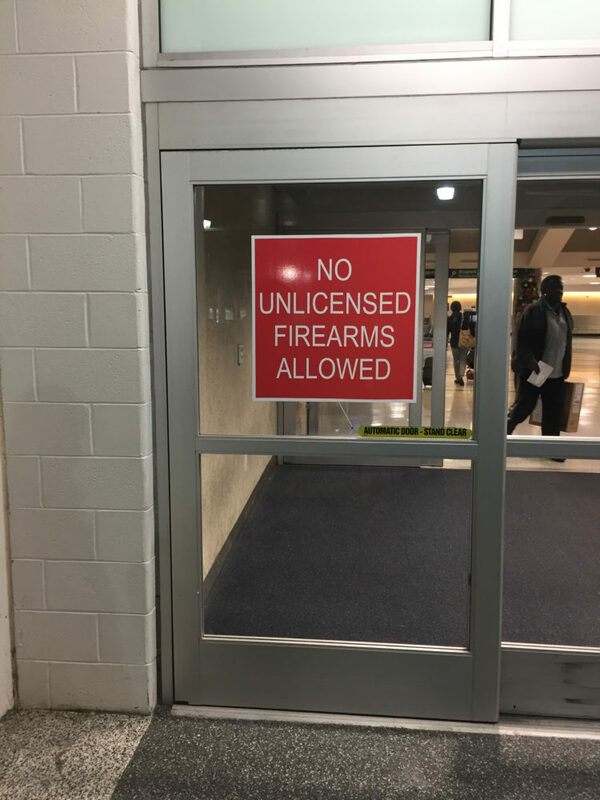 Open carry laws in many other states already permit licensed gun owners to bring firearms into the public areas of airports and in June a man dropping his daughter off at Hartsfield-Jackson Atlanta International made national news by walking through the airport carrying an AR-15 rifle. Are TSA PreCheck centers easy-access? No balloons fell from the ceiling last week when the U.S. Department of Homeland Security celebrated the fact that over 500,000 travelers have handed over personal data – and $85 – to join the Transportation Security Administration’s expedited airport screening program since the first public enrollment center opened at Indianapolis International Airport in December 2013. Today, the Global Gateway Alliance, a group that advocates for improvements at the New York metropolitan area airports, released a report offering TSA advice on how to push the PreCheck enrollment numbers higher. There are currently about 300 PreCheck application sites nationwide processing, altogether, more than four thousand new applications a day. Twenty-eight of those sites are in airports (LAX and ATL each have two), with many others co-located at pre-existing sites in strip malls, office and industrial parks, and a few chiropractic offices contracted to do credentialing for airport and railroad workers and for truck drivers hauling hazardous materials to and from port facilities. As examples, GGA notes that of the three enrollment centers in New Jersey, two are in suburban commercial buildings that don’t stay open past 4:30 p.m. on weekdays. “The third location, in Newark, is almost 9 miles from Newark Airport and not near the Central Business District,” the report states, while the TSA pre-application site in Lackawanna, N.Y., is adjacent to a gun shop and a firearms training store and located inside a private investigation office. The range of off-airport sites “makes it easier for the traveling public to apply for TSA PreCheck,” said TSA’s Feinstein. But putting enrollment centers “in places where people actually congregate, which can be conveniently accessed, would raise awareness and participation the program,” the GGA suggests. Have you applied for the PreCheck program? How did it go? 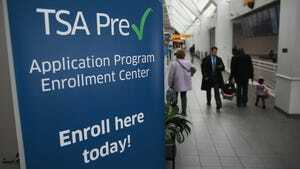 (My story about TSA Precheck centers first appeared on USA TODAY). Friday night the details of how – and why – a man showed up at Los Angeles International Airport with a rifle and shot his way through Terminal 3 are still being pieced together. A lot is already known. The man doing the shooting has been identified as 23-year-old Los Angeles resident Paul Anthony Ciancia. A TSA officer – 39-year-old Gerardo I. Hernandez – was killed and perhaps a half dozen other people, including two other TSA officers, were injured. And thousands of passengers at LAX and other airports around the country had a travel day seriously disrupted. More than 700 flights were canceled or delayed. Close to 50 were diverted to other airports. And pretty much everyone is shocked and freaked out. Here’s a link to a story from by Brian Sumers and Larry Altman that does a really good job of describing the events of the day. Sumers was one of the reporters on-site and tweeting from LAX most of the day. A lot more details will surely be revealed in the days ahead and we’ll be horrified by them all. In the meantime, as it does most every Friday afternoon, the TSA released a tally of the number of guns found – but luckily not fired – at airport security checkpoints this week. This week 29 guns were discovered at airport security checkpoints. 27 were loaded. 9 had rounds chambered. And, as we know, one loaded rifle was used to wreak havoc at LAX airport.